This article is about the traditional Chinese. For the most commonly and officially used calendar in modern China, see Gregorian calendar and Adoption of the Gregorian calendar § China. The traditional China calendar (officially known as the Rural Calendar [農曆; 农历; Nónglì; 'farming calendar']), or Former Calendar (舊曆; 旧历; Jiùlì), Traditional Calendar (老曆; 老历; Lǎolì) or Lunar Calendar (陰曆; 阴历; Yīnlì; 'yin calendar'), is a lunisolar calendar which reckons years, months and days according to astronomical phenomena. It is defined by GB/T 33661-2017, "Calculation and promulgation of the Chinese calendar", issued by the Standardisation Administration of China on 12 May 2017. Although modern day China uses the Gregorian calendar, the traditional Chinese calendar governs holidays (such as the Chinese New Year) in China and in overseas Chinese communities. It lists the dates of traditional Chinese holidays and guides people in selecting auspicious days for weddings, funerals, moving, or starting a business. Like Chinese characters, variants of this calendar are used in different parts of the Chinese cultural sphere. Korea, Vietnam, and the Ryukyu Islands adopted the calendar, and it evolved into Korean, Vietnamese, and Ryukyuan calendars. The main difference from the traditional Chinese calendar is the use of different meridians, which leads to some astronomical events—and calendar events based on them—falling on different dates. The traditional Japanese calendar also derived from the Chinese calendar (based on a Japanese meridian), but its official use in Japan was abolished in 1873 as part of reforms after the Meiji Restoration. Calendars in Mongolia and Tibet have absorbed elements of the traditional Chinese calendar, but are not direct descendants of it. Days begin and end at midnight, and months begin on the day of the new moon. Years begin on the second (or third) new moon after the winter solstice. Solar terms govern the beginning and end of each month. Written versions in ancient China[when?] included stems and branches of the year and the names of each month, including leap months as needed. Characters indicated whether a month was long (大, 30 days) or short (小, 29 days); stem branches for the first, eleventh, and 21st days, and the date, stem branch and time of the solar terms. The traditional Chinese calendar was developed between 771 and 476 BC, during the Spring and Autumn period of the Eastern Zhou dynasty. Before the Zhou dynasty, solar calendars were used. One version of the solar calendar is the five-elements calendar (五行曆; 五行历), which derives from the Wu Xing. A 365-day year was divided into five phases of 73 days, with each phase corresponding to a Day 1 Wu Xing element. A phase began with a governing-element day (行御), followed by six 12-day weeks. Each phase consisted of two three-week months, making each year ten months long. Years began on a jiǎzǐ (甲子) day (and a 72-day wood phase), followed by a bǐngzǐ day (丙子) and a 72-day fire phase; a wùzǐ (戊子) day and a 72-day earth phase; a gēngzǐ (庚子) day and a 72-day metal phase, and a rénzǐ day (壬子) followed by a water phase. Other days were tracked using the Yellow River Map (He Tu). 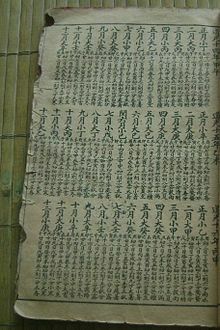 Another version is a four-quarters calendar (四時八節曆; 四时八节历; 'four sections, eight seasons calendar', or 四分曆; 四分历). Weeks were ten days long, with one month consisting of three weeks. A year had 12 months, with a ten-day week intercalated in summer as needed to keep up with the tropical year. The 10 Heavenly Stems and 12 Earthly Branches were used to mark days. A third version is the balanced calendar (調曆; 调历). A year was 365.25 days, and a month was 29.5 days. After every 16th month, a half-month was intercalated. According to oracle bone records, the Shang dynasty calendar (c. 1600 – c. 1046 BC) was a balanced calendar with 12 to 14 months in a year; the month after the winter solstice was Zhēngyuè. The first lunisolar calendar was the Zhou calendar (周曆; 周历), introduced under the Zhou dynasty. This calendar set the beginning of the year at the day of the new moon before the winter solstice. It also set the shàngyuán as the winter solstice of a dīngsì year, making the year it was introduced around 2,758,130. Several competing lunisolar calendars were also introduced, especially by states fighting Zhou control during the Warring States period. The state of Lu issued its own Lu calendar(魯曆; 鲁历). Jin issued the Xia calendar (夏曆; 夏历) in AD 102, with a year beginning on the day of the new moon nearest the March equinox. Qin issued the Zhuanxu calendar (顓頊曆; 颛顼历), with a year beginning on the day of the new moon nearest the winter solstice. Song's Yin calendar (殷曆; 殷历) began its year on the day of the new moon after the winter solstice. 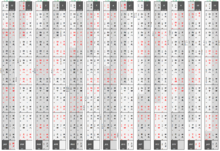 These calendars are known as the six ancient calendars (古六曆; 古六历), or quarter-remainder calendars, (四分曆; 四分历; sìfēnlì), since all calculate a year as ​365 1⁄4 days long. Months begin on the day of the new moon, and a year has 12 or 13 months. Intercalary months (a 13th month) are added to the end of the year. The Qiang and Dai calendars are modern versions of the Zhuanxu calendar, used by mountain peoples. After Qin Shi Huang unified China under the Qin dynasty in 221 BC, the Qin calendar (秦曆; 秦历) was introduced. It followed most of the rules governing the Zhuanxu calendar, but the month order was that of the Xia calendar; the year began with month 10 and ended with month 9, analogous to a Gregorian calendar beginning in October and ending in September. The intercalary month, known as the second Jiǔyuè (後九月; 后九月; 'later Jiǔyuè'), was placed at the end of the year. The Qin calendar was used into the Han dynasty. Emperor Wu of Han r. 141 – 87 BC introduced reforms halfway through his reign. His Taichu Calendar (太初曆; 太初历; 'grand beginning calendar') defined a solar year as ​365 385⁄1539 days, and the lunar month was ​29 43⁄81 days. This calendar introduced the 24 solar terms, dividing the year into 24 equal parts. Solar terms were paired, with the 12 combined periods known as climate terms. The first solar term of the period was known as a pre-climate, and the second was a mid-climate. Months were named for the mid-climate to which they were closest, and a month without a mid-climate was an intercalary month. The Taichu calendar established a framework for traditional calendars, with later calendars adding to the basic formula. The Dàmíng Calendar (大明曆; 大明历; 'brightest calendar'), created in the Liang dynasty by Zu Chongzhi, introduced the equinoxes. The use of a syzygy to determine the lunar month was first described in the Tang dynasty Wùyín Yuán Calendar (戊寅元曆; 戊寅元历; 'earth tiger epoch calendar'). The Yuan dynasty Shòushí calendar (授時曆; 授时历; 'teaching time calendar') used spherical trigonometry to find the length of the tropical year. The calendar had a 365.2425-day year, identical to the Gregorian calendar. Although the Chinese calendar lost its place as the country's official calendar at the beginning of the 20th century, its use has continued. The Republic of China adopted UTC+08:00 in 1928, but the change to a single time zone ; some calendars followed the last calendar of the Qing dynasty, published in 1908. This caused confusion about the date of the 1978 Mid-Autumn Festival, and those areas then switched to the UTC+8-based calendar. During the late Ming dynasty, Xu Guangqi and his colleagues worked out a new calendar based on Western astronomical arithmetic; however, the new calendar was not released before the end of the dynasty. In the early Qing dynasty, Johann Adam Schall von Bell submitted the calendar to the Shunzhi Emperor. The Qing government issued it as the Shíxiàn (seasonal) calendar. The baseline is Chinese Standard Time, rather than Beijing local time. Astronomical data is used, rather than mathematical calculations. To optimize the Chinese calendar, astronomers have proposed a number of changes. Gao Pingzi (高平子; 1888–1970), a Chinese astronomer who co-founded the Purple Mountain Observatory, proposed that month numbers be calculated before the new moon and solar terms be rounded to the day. Since the intercalary month is determined by the first month without a mid-climate and the mid-climate time varies by time zone, countries which adopted the calendar but calculate with their own time could vary from the time in China. Calendars of ethnic groups in the mountains and plateaus of southwestern China and the grasslands of northern China are based on their phenology and algorithms of traditional calendars of different periods, particularly the Tang and pre-Qin dynasties. Month, the time from one new moon to the next. These synodic months are about ​29 17⁄32 days long. Date, when a day occurs in the month. Days are numbered in sequence from 1 to 29 (or 30). Year, the time of one revolution of the earth around the sun. It is measured from the first day of spring (lunisolar year) or the winter solstice (solar year). A year is about ​365 31⁄128 days. Zodiac, ​1⁄12 year, or 30° on the ecliptic. A zodiac is about ​30 7⁄16 days. Solar term, ​1⁄24 year, or 15° on the ecliptic. A solar term is about ​15 7⁄32 days. Calendar month, when a month occurs within a year. Some months may be repeated. Calendar year, when it is agreed that one year ends and another begins. The year begins on the first day of spring, defined as the second (sometimes third) new moon after the winter solstice. A calendar year is 353–355 or 383–385 days long. The Chinese calendar is lunisolar, similar to the Hindu and Hebrew calendars. The movements of the sun, moon, Mercury, Venus, Mars, Jupiter and Saturn (known as the seven luminaries) are the references for calendar calculations. The distance between Mercury and the sun is less than 30° (the sun's height at chénshí:辰時, 8:00 to 10:00 am), so Mercury was sometimes called the "chen star" (辰星); it is more commonly known as the "water star" (水星). Venus appears at dawn and dusk, and is known as the "bright star" (啟明星; 启明星) or "long star" (長庚星; 长庚星). Mars looks like fire and occurs irregularly, and is known as the "fire star" (熒惑星; 荧惑星 or 火星). Mars is the punisher in Chinese mythology. When Mars is near Antares (心宿二), it is a bad omen and can forecast the death of an emperor or removal of a chancellor (荧惑守心). The period of Jupiter's revolution is 11.86 years, so Jupiter is called the "age star" (歲星; 岁星); 30° of Jupiter's revolution is about a year on earth. The period of Saturn's revolution is about 28 years. Saturn, known as the "guard star" (鎮星), guards one of the 28 mansions every year. The Big Dipper is the celestial compass, and its handle's direction determines the season and month. The stars are divided into Three Enclosures and 28 Mansions according to their location in the sky relative to Ursa Minor, at the centre. Each mansion is named with a character describing the shape of its principal asterism. The Three Enclosures are Purple Forbidden, (紫微), Supreme Palace (太微), and Heavenly Market. (天市) The eastern mansions are 角, 亢, 氐, 房, 心, 尾, 箕. Southern mansions are 井, 鬼, 柳, 星, 张, 翼, 轸. Western mansions are 奎, 娄, 胃, 昴, 毕, 参, 觜. Northern mansions are 斗, 牛, 女, 虚, 危, 室, 壁. The moon moves through about one lunar mansion per day, so the 28 mansions were also used to count days. In the Tang dynasty, Yuan Tiangang (袁天罡) matched the 28 mansions, seven luminaries and yearly animal signs to yield combinations such as "horn-wood-flood dragon" (角木蛟). Several coding systems are used to avoid ambiguity. The Heavenly Stems is a decimal system. The Earthly Branches, a duodecimal system, mark dual hours (shí, 時; 时 or shíchen (時辰; 时辰)) and climatic terms. The 12 characters progress from the first day with the same branch as the month (first Yín day (寅日) of Zhēngyuè; first Mǎo day (卯日) of Èryuè), and count the days of the month. The stem-branches is a sexagesimal system. The Heavenly Stems and Earthly Branches make up 60 stem-branches. The stem-branches mark days and years. The five elements of the Wu Xing are assigned to each of the stems, branches and stem-branches. China has used the Western hour-minute-second system to divide the day since the Qing dynasty. Several era-dependent systems had been in use; systems using multiples of twelve and ten were popular, since they could be easily counted and aligned with the Heavenly Stems and Earthly Branches. For more information on the adoption of the seven-day week, see Names of the days of the week § East_Asian_tradition. For more information on the ten-day week, see Decan. As early as the Bronze-Age Xia dynasty, days were grouped into nine- or ten-day weeks known as xún (旬). Months consisted of three xún. The first 10 days were the early xún (上旬), the middle 10 the mid xún (中旬), and the last nine (or 10) days were the late xún (下旬). Japan adopted this pattern, with 10-day-weeks known as jun (旬). In Korea, they were known as sun (순,旬). The structure of xún led to public holidays every five or ten days. During the Han dynasty, officials were legally required to rest every five days (twice a xún, or 5–6 times a month). The name of these breaks became huan (澣; 浣, "wash"). Grouping days into sets of ten is still used today in referring to specific natural events. "Three Fu" (三伏), a 29–30-day period which is the hottest of the year, reflects its three-xún length. After the winter solstice, nine sets of nine days were counted to calculate the end of winter. The seven-day week was adopted from the Hellenistic system by the 4th century CE, although its source is unclear. It was again transmitted to China in the 8th century by Manichaeans via Kangju (a Central Asian kingdom near Samarkand),[a][b] and is the most-used system in modern China. Months are defined by the time between new moons, which averages approximately ​29 17⁄32 days. There is no specified length of any (numbered) Chinese month, so e.g. the first month will have 29 days (short month, 小月) in some years and 30 days (long month, 大月) in other years. A 12-month-year using this system has 354 days, which would drift significantly from the tropical year. To fix this, traditional Chinese years have a 13-month year approximately once every three years. The 13-month version has the same alternation of long and short months, but adds a 30-day leap month (閏月) at the end of the year. Years with 12 months are called common years, and 13-month years are known as long years. Although most of the above rules were used until the Tang dynasty, different eras used different systems to keep lunar and solar years aligned. The synodic month of the Taichu calendar was ​29 43⁄81 days long. The 7th-century, Tang-dynasty Wùyín Yuán Calendar was the first to determine month length by synodic month instead of the cycling method. Since then, month lengths have primarily been determined by observation and prediction. The days of the month are numbered beginning with 1, and the day number is written with two characters. Days one to 10 are written with the day numeral, preceded by the character Chū (初); Chūyī (初一) is the first day of the month, and Chūshí (初十) the 10th. Days 11 to 20 are written as numerals; Shíwǔ (十五) is the 15th day of the month, and Èrshí (二十) the 20th. Days 21 to 29 are written with the character Niàn (廿) before the characters one through nine; Niànsān (廿三), for example, is the 23rd day of the month. Day 30 (as applicable) is written as the numeral Sānshí (三十). Tiānshèng 1st year....Èryuè....Dīngsì, the emperor's funeral was at his temple, and the imperial portrait was installed in Nanjing's Hongqing Palace. Because astronomical observation determines month length, dates on the calendar correspond to moon phases. The first day of each month is the new moon. On the seventh or eighth day of each month, the first-quarter moon is visible in the afternoon and early evening. In the 15th or 16th day of each month, the full moon is visible all night. On the 22nd or 23rd day of each month, the last-quarter moon is visible late at night and in the morning. Since the beginning of the month is determined by the new moon occurs, other countries using this calendar use their own time standards to calculate it; this results in deviations. The first new moon in 1968 was at 16:29 UTC on January 29. Since North Vietnam used UTC+07:00 to calculate their Vietnamese calendar and South Vietnam used UTC+08:00 (Beijing time) to calculate theirs, North Vietnam began the Tết holiday at 29 January at 23:29 and South Vietnam began it on 30 January at 00:15. The time difference allowed asynchronous attacks in the Tet Offensive. Lunar months were originally named according to natural phenomena. Current naming conventions use numbers as the month names. Every month is also associated with one of the twelve Earthly Branches. The Dragon Boat Festival falls on May 5th on Lunar Calendar, whereas the Double Ninth Festival, Lantern Festival, and Qixi Festival fall on September 9th, January 15th, and July 7th on Lunar Calendar, respectively. The Dragon Boat Festival falls on 5th Month 5th Day on Lunar Calendar, whereas the Double Ninth Festival, Lantern Festival, and Qixi Festival fall on 9th Month 9th Day, 1st Month 15th Day, and 7th Month 7th Day on Lunar Calendar, respectively. The Dragon Boat Festival falls on Horse Month 5th on Lunar Calendar, whereas the Double Ninth Festival, Lantern Festival, and Qixi Festival fall on Dog Month 9th, Tiger Month 15th, and Monkey Month 7th on Lunar Calendar, respectively. One may even find out the heavenly stem and earthly branch corresponding to a particular day in the month, and those corresponding to its month, and those to its year, in order to determine the Four Pillars of Destiny associated with it, for which the Tung Shing, also referred to as the Chinese Almanac of the year, or the Huangli, and containing the essential information concerning Chinese astrology, is the most convenient publication to consult. Days rotate through a sexagenary cycle marked by a coordination between heavenly stems and earthly branchs, hence the referral to the Four Pillars of Destiny as, "Bazi", or "Birth Time Eight Characters", with each pillar consisting of a character for its corresponding heavenly stem, and another for its earthly branch. Since Huangli days are sexagenaric, their order is quite independent from their numeric order in each month, and from their numeric order within a week (referred to as True Animals with relation to the Chinese zodiac). Therefore, it does require painstaking calculation for one to arrive at the Four Pillars of Destiny of a particular given date, which rarely outpace the convenience of simply consulting the Huangli by looking up its Gregorian date. The solar year (歲; 岁; Suì), the time between winter solstices, is divided into 24 solar terms. Different versions of the traditional calendar might have different average solar-year lengths. One solar year of the 1st century BC Tàichū calendar is ​365 385⁄1539 (365.25016) days. A solar year of the 13th-century Shòushí calendar is ​365 97⁄400 (365.2425) days, identical to the Gregorian calendar. The additional .00766 day from the Tàichū calendar leads to a one-day shift every 130.5 years. Pairs of solar terms are climate terms, or solar months. The first solar term is "pre-climate" (節氣; 节气; Jiéqì), and the second is "mid-climate" (中氣; 中气; Zhōngqì). There are generally 11 or 12 complete months, plus two incomplete months around the winter solstice, in a solar year. The 11 mid-climates, except for the winter solstice, are in the 11 or 12 complete months. The complete months are numbered from 0 to 10, and the incomplete months are considered the 11th month. The first month without a mid-climate is the leap, or intercalary, month. Leap months are numbered with rùn 閏, the character for "intercalary", plus the name of the month they follow. In 2017, the intercalary month after month six was called Rùn Liùyuè, or "intercalary sixth month" (閏六月) and written as 6i or 6+. The next intercalary month (in 2020, after month four) will be called Rùn Sìyuè (閏四月) and written 4i or 4+. The lunisolar year begins with the first spring month, Zhēngyuè (正月; 'capital month'), and ends with the last winter month, Làyuè (臘月; 腊月; 'sacrificial month'). All other months are named for their number in the month order. If a leap month falls after month 11—as it will in 2033—the 11th month will be Shíèryuè (十二月; 'twelfth month'), and the leap month will be Làyuè. Years were traditionally numbered by the reign in ancient China, but this was abolished after the founding of the People's Republic of China in 1949. For example, the year from 8 February 2016 to 27 January 2017 was a Bǐngshēn year (丙申年) of 12 months or 354 days . During the Tang Dynasty, the Earthly Branches were used to mark the months from December 761 to May 762. Over this period, the year began with the winter solstice. In China, a person's official age is based on the Gregorian calendar; for traditional use, age is based on the Chinese calendar. At birth, a child is considered the first year of lifetime using ordinal number (instead of "zero" using cardinal number); after each Chinese New Year, one year is added to their traditional age. Because of the potential for confusion, infant ages are often given in months instead of years. After the Gregorian calendar's introduction in China, the Chinese traditional age was referred to as the "nominal age" (虛歲; 虚岁; xūsuì; 'fake age') and the Gregorian age was known as the "real age" (實歲; 实岁; shísùi; 'real age'). In ancient China, years were numbered from a new emperor's assumption of the throne or an existing emperor's announcement of a new era name. The first recorded reign title was Jiànyuán (建元; 'founding era'), from 140 BC; the last reign title was Xuāntǒng (宣統; 宣统; 'announcing unification'), from 1908 AD. The era system was abolished in 1912, after which the current or Republican era was used. The 60 stem-branches have been used to mark the date since the Shang Dynasty (1600-1046 BC). Astrologers knew that the orbital period of Jupiter is about 4,332 days. Since 4332 is 12 × 361, Jupiter's orbital period was divided into 12 years (歲; 岁; suì) of 361 days each. The stem-branches system solved the era system's problem of unequal reign lengths. No reference date is universally accepted. The most popular is the Gregorian calendar (公曆; 公历; gōnglì; 'common calendar'). On 2 January 1912, Sun Yat-sen announced changes to the official calendar and era. 1 January was 14 Shíyīyuè 4609 Huángdì year, assuming a year 1 of 2698 BC. The change was adopted by many overseas Chinese communities, such as San Francisco's Chinatown. Publications began using the estimated birth date of the Yellow Emperor as the first year of the Han calendar in 1903, with newspapers and magazines proposing different dates. The province of Jiangsu counted 1905 as the year 4396 (using a year 0 of 2491 BC), and the newspaper Ming Pao (明報; 明报) reckoned 1905 as 4603 (using a year 0 of 2698 BC). Liu Shipei (劉師培, 1884–1919) created the Yellow Emperor Calendar, with year 0 as the birth of the emperor (which he determined as 2711 BC). There is no evidence that this calendar was used before the 20th century. Liu calculated that the 1900 international expedition sent by the Eight-Nation Alliance to suppress the Boxer Rebellion entered Beijing in the 4611th year of the Yellow Emperor. The plum-rains season (梅雨), the rainy season in late spring and early summer, begins on the first bǐng day after Mangzhong (芒种) and ends on the first wèi day after Xiaoshu (小暑). The Three Fu (三伏; sānfú) are three periods of hot weather, counted from the first gēng day after the summer solstice. The first fu (初伏; chūfú) is 10 days long. The mid-fu (中伏; zhōngfú) is 10 or 20 days long. The last fu (末伏; mòfú) is 10 days from the first gēng day after the beginning of autumn. The Shujiu cold days (數九; shǔjǐu; 'counting to nine') are the 81 days after the winter solstice (divided into nine sets of nine days), and are considered the coldest days of the year. Each nine-day unit is known by its order in the set, followed by "nine" (九). This page is based on the Wikipedia article Chinese calendar; it is used under the Creative Commons Attribution-ShareAlike 3.0 Unported License (CC-BY-SA). You may redistribute it, verbatim or modified, providing that you comply with the terms of the CC-BY-SA.